Here is the Christmas present I made for myself… or what’s left of it anyway. You don’t have to be Polish to love a slice (or 2 or 3) of makowiec (mah-KOH-viets). It’s usually a bread to be shared but this one is all for me! I made it without the powdered sugar glaze and opted for an egg wash and poppy seeds on the top. The filling is made with ground poppy seeds, fresh orange and lemon peel, ground almonds and vanilla. It’s a Polish holiday bread for Christmas as well as Easter but I say make it for any holiday, or birthday, or laundry day, or tax day…. Click here for the recipe. 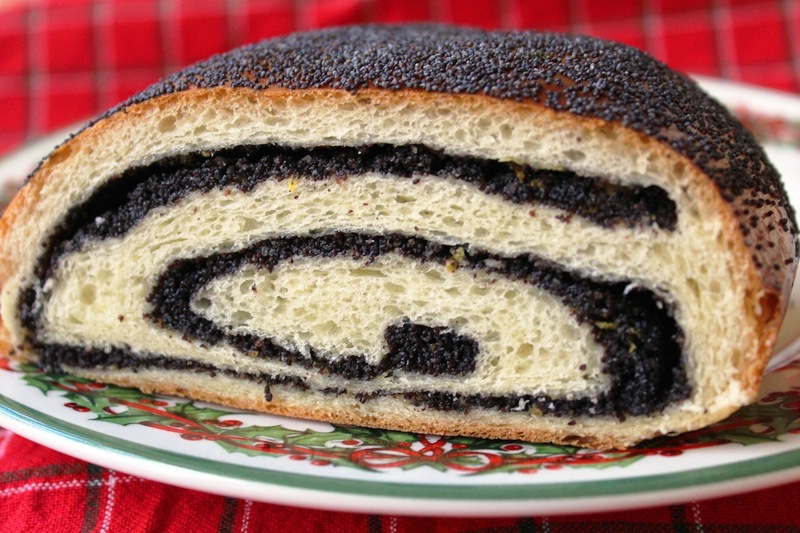 16 Comments on "Merry Christmas (to me)"
I bake four poppyseed rolls every Easter. Rarely do I bake a poppyseed roll that does not ooze from the bottom seam. I use Solo canned poppyseed fillind and add 1 teaspoon of vanilla & 1/2 teas of cardamon to the filling. I also add 1/2 teas cardamon to the dough recipe. I got the cardamon idea from an old polish cookbook. Delicious! Happy holidays Jenny to you and yours. Merry Christmas and Happy New Years to you and yours. Thank you for the recipes and smiles you have given. You make me take life a little easier with your suggestions for food and I cannot say thank you enough for your quirky sense of the ridiculous. It’s like having a comfortable place to retreat to while I enjoy your videos and read your work. Keep buying spatulas and heating things up in the kitchen. Greetings Jenny, from Singapore. Love all your recipes. Have baked crispy oatmeal cookies and it is always a favorite to all my friends. Just baked the one bowl chocolate cupcake today! Awesome! Looking forward to learn more from you. Wishing for more new videos from you too! Merry Christmas Jenny , I shared your no knead bread with all my family and they love it,i dropped off one to each lol , I am going to make this makowiec bread next ,thank you for sharing it ,, I remember my parents buying this one at the bakery ,,,now I am going to try also, will send you a picture when I make it . May you enjoy a pleasant, peaceful and enjoyable Christmas with your loved ones. May the joy of Christmas endure throughout the coming years so that good health and happiness rule your life. Christine xxxooo. And a Happy & Healthy New Year! Love your recipes. Your the best. MERRY CHRISTMAS AND A HAPPY NEW YEAR..LOVE YOU AND TAKE CARE..GOD BLESS YOU FOR SO MANY WONDERFUL RECIPES..
Merry Christmas Jenny. I have watched most of (probably all) your videos..so much so that now when I read your writing I can imagine hearing your voice. Love your wonderful sense of humor and your great recipes. I plan to try this soon. I have already bought the poppy seed. Merry Christmas Jenny. We had your pan pizza last night for Christmas Eve and today I’m making your dinner rolls for our Christmas dinner. Enjoy your present to yourself. It looks yummy. You inspire me. Especially when I am making things that I get from you. Merry Christmas or Happy Holidays. Merry Christmas to you and your family. I love the looks of the poppy seed cake, don’t know how my teeth will look after eating it though!!! Love your recipes. Merry Christmas to you also. This looks delicious! Thanks for all of your wonderful recipes.